The 26th Annual CHArt: The Challenge of Ubiquity in Digital Culture :: November 17-18, 2011 :: London, UK :: Call for Papers – Deadline: July 1, 2011. Utopian hopes for the ubiquity of digital and networked technologies leading to a more transparent and democratic society are being met by expressions of concern about their implications for art. Nicholas Bourriaud has observed that such technologies can bring about a “collective desire to create new areas of conviviality and introduce new types of transaction with regard to the cultural object”. However, others perceive an imminent threat, characterised by such terms as a digital ‘deluge’ or ‘oblivion’. CHArt is interested to examine critically both positive views and apocalyptic concerns about the implications of the widespread merger of telecommunications and computer technology in society for art, its history and practice. The implications of the ubiquity of digital and network technologies for evaluating what constitutes an original work of art and the originality of its creator(s). What effects have these technologies had on valuing art in terms of its aesthetic quality? What impact have real-time technologies had for the creation, ownership and distribution of culture? What are the impacts of the widespread proliferation and use of such technologies on curatorial practice and the processes of selecting, preserving and enabling access to art? How have they affected both the content and methods of teaching the history and practice of art? Are other disciplines and areas of society affected by art mediated by real-time technologies? How? We are particularly interested in work that engages with such questions and extends beyond simply understanding digital and network technologies as transparent conduits of data and information. CHArt encourages proposals addressing complex artefacts that, in Friedrich Kittler’s words, “determine our situation”. Contributions are welcomed from all sections of the CHArt community on the intersection between art and art history and semantic web developments; cloud computing; data mining; screen scraping; crowd sourcing; mashups; and freely available sites that enable data and images to be stored and accessed. 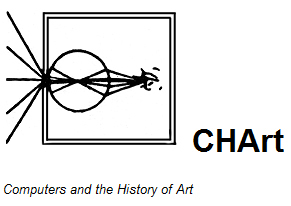 CHArt seeks papers from art historians, artists, architects and architectural theorists and historians, curators, conservators, computing scientists, scientists, cultural and media theorists, archivists, technologists, educationalists and philosophers. Postgraduate students are encouraged to submit a proposal. CHArt is able to offer assistance with the conference fees for up to three student delegates. Priority will be given to students whose papers are accepted for presentation. An application form and proof of university enrolment will be required. For further details about the Helene Roberts Bursary please email anna.bentkowska [at] kcl.ac.uk. Submissions should be in the form of a 300-400 word synopsis of the proposed paper with brief biographical information (no more than 200 words) of presenter/s, and should be emailed to chart [at] kcl.ac.uk by Friday July 1st 2011. Please note that submissions exceeding the stated word count will not be considered.